Residents of Dublin’s new rapid-build housing have detailed an overall positive experience of their new accommodation, but many have said they still feel a profound sense of insecurity – the majority having previously experienced emergency accommodation. 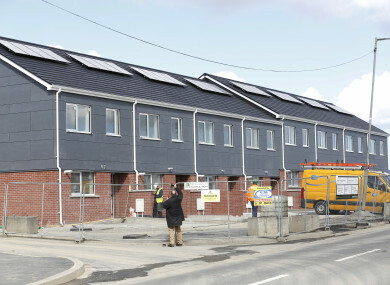 A new report, Home at Last, published by Dublin City Council has detailed the experiences of residents of the first two rapid-build developments in the north of the city – in Ballymun and Finglas. Since its announcement in 2015, rapid-build housing has been widely debated, with concerns raised regarding their quality, cost and completion delays. All of 22 Ballymun and 29 out of a total 39 Finglas residents were homeless prior to being offered rapid-build housing (the remaining 10 Finglas residents were allocated from the Dublin City Council housing waiting list). Residents were overall very positive about their new rapid-build homes, according to the report. Overall, residents were extremely satisfied with the size, quality and affordability of their new homes. It’s everything. I mean, when I went to the homeless I had not a thing, all I had was clothes and the kids, so when I moved here we had literally knives, forks, spoons, plates, everything, not just the basics. Whilst residents were generally positive about their houses, there were common concerns regarding structure and longevity. There was some anxiety expressed regarding the quality of the rapid-builds and whether they would stand the test of time. In some Finglas houses, the heating and hot water were still not working, or were intermittent. Across both developments, many residents remained unsure of how to use their boilers. Some of the houses in Ballymun remain without front gates. The report outlined that this is of particular concern for parents with young children who feel it is unsafe to let their children pay outside, particularly as the majority of the Ballymun rapid-builds face onto a main road. Furthermore, many residents highlighted cracks in the plastering, and although some had been told this was due to the plaster “settling”, they remained unsure as to what that meant. Although residents were by-and-large satisfied with their new houses, some residents reported that they continue to feel insecure, both in terms of their safety in the local area, and their struggles to process now living in permanent accommodation. This highlights the ongoing trauma of homelessness. For Jess*, signing a permanent contract had not alleviated an ongoing sense that the security of her new housing would be taken away from her. I’m still waiting for someone to knock at the door and say, ‘You have to move again’… it’s like I’m here for life now but I’m still like, I’m still mentally broken… even thought we’re here it’s like it’s still not… for me it’s still not happening. A year after they had first moved in, Ballymun residents were offered permanent tenancies. At the time of writing the report, six of the 22 households remained on a temporary contract. All residents of the Finglas development had been offered permanent tenancies from the outset. Many other residents also commented that they couldn’t believe that they finally had a permanent home. “I wouldn’t believe it until I signed the document [permanent contract], I wouldn’t… because they could take it off you any time, you know?” Cliona* said. I have to be honest, for the first two weeks, every morning I woke up, I was still kind of like ‘Oh God, it is real, it did happen’. A prevailing sense of insecurity among residents also manifested in other ways. Prior to being made homeless, Shaun* and his family had a dog. However, they had been forced to give her away when they moved into hotels due to their strict no-pets policy. He explained that now having a permanent home, he would not consider getting another dog. “Now that we have a home here, I don’t think I would [get another dog]. I know we have a back garden and all like for the dog, but I don’t think I could get a dog again,” he said. The report was written by Professor Katherine Brickell, Dr Mel Nowicki and Dr Ella Harris of the University of London. In their conclusion, the authors said that “solving Dublin’s housing crisis cannot be fully realised without acknowledging the private rented sector as a major route into homelessness”. “While we acknowledge that there is a clear need to improve suitability and standards in interim and emergency accommodation, levels of homelessness are unlikely to reduce if the insecurity of the private rented sector is not tackled and the quantity of permanent social housing solutions is not urgently addressed,” the report said. High-quality, secure and permanent social housing provided through the rapid-build scheme is an unequivocal and fundamental solution to Dublin’s housing crisis for many families. *Residents names have been changed to preserve anonymity. Email “Residents happy with rapid-build homes - but some still feel a prevailing sense of insecurity”. Feedback on “Residents happy with rapid-build homes - but some still feel a prevailing sense of insecurity”.